O. Yıldırım & M. Beyribey (1991): Tarım ve Köyişleri Bakanlığı, KHGM, Ankara. A. Korukçu & O. Yıldırım (1981): Topraksu Genel Müdürlüğü, Ankara. Y. Sözer (1972): Pimaş A.Ş. Yayınları, İstanbul. Harlan G. Collins(1972): Irrigation and Drainage Specialty Conference, Spokane Washington, September 26-28,1972. Albert E. Gibbs(1972): Irrigation and Drainage Specialty Conference, Spokane Washington, September 26-28,1972. Cheng, Chun-Tse (1983): Executive Yuan, R.O. C.
J. Ian Steward et al. (1973): University of California, Prepared for USBR. Proceedings from the 1992 National Conference (1992): US Committee on Irrigation and Drainage, October 5-7 1992, Phoenix, Arizona, pp.345. J. Price Gittinger (1982): World Bank, EDI, John Hopkins University Press, Baltimore and London, pp 505. Robert Finley & Dean Brown(1975): Çeviren Nuri İsen, DSİ. Documents entered in the Irrigation Management Informatıon Network (IMIN) Database in 1988, Volume 2, Number 1. John L. Merriam(1990):Irrigation Department, Khargone, Madhy Pradesh, June 1990. Don J. Wood and Carl O.A. Charles(1972): Proceedings of the American Society of Civil Engineers, Journal of the Hydraulic Division. 69. Design of Reinforced Concrete Low Head Pressure Pipe and Several Case Studies in U.S.
Faruk Volkan(nd): DSİ Proje İnşaat Dairesi Başkanlığı, Ankara. E.W. Kiesling & R.C. DeHart (1969): Southwest Research Institute, San Antonia, Texas. Yunus Doğramacı(1975): DSİ Etüd ve Plan Dairesi Başkanlığı, Ankara. Bülent Sağnak(1975): DSİ Etüd ve Plan Dairesi Başkanlığı, Ankara. Abdülmesih Abidoğlu(1975): DSİ Etüd ve Plan Dairesi Başkanlığı, Ankara. Mınıstry of Agriculture and Forestry & ITAL-ICID (1987):On the Occasion of the XIII th International Congress on Irrigation and Drainage, Casablanca, Morocco. Journal of Irrigation Engineering and Rural Planning (1989): Special Edition, number 16, July 1989. Bureau of Reclamation(1974): U.S. Department of Interior , Denver, Colorado. Bureau of Reclamation(1974):U.S. Department of Interior, Denver, Colorado. Bureau of Reclamation(1967):U.S. Department of Interior, Denver, Colorado. Bureau of Reclamation(1976): U.S. Department of Interior, Denver, Colorado. Turgut Akgül & Mevlut Aydın (nd): DSİ Proje ve İnşaat Daire Başkanlığı, Ankara. Hervé Plusquellec(1988): The Economic Development Institute of the World Bank, Washington, D.C. 20433. CEMAGREF-IIMI (1992): International Workshop on Application of Mathematical Modelling for the Improvement of Irrigation Canal Operation, October 26-30 1992, Montpellier, France, pp 335. Willem F. Flotman and Hector M. Melano (1987): International IrrigationCenter, Utah State University, pp 331. C.P. Buyalski et al. (1991): USBR, Denver Office, First Edition 1991, pp 113. ASELSAN (1993) : Sistem Mühendislik (otomasyon) Müdürlüğü / Mikrodalga ve Sistem Teknolojileri Grubu 16/11/93. L. Eyüboğlu (1992): DSİ Proje ve İnşaat Dairesi Başkanlığı, Ankara. Derek Byerlee & Gary E. Alex (1998): The World Bank Washington, D.C.
Walter J. Ochs and Bishay G. Bishay (1992): World Bank Technical Paper Number 195, Washington D.C., pp 187. US Department of Interior Bureau of Reclamation (1978): US Government Printing House, Denver, Colorado, pp 286. Naili Özer(1984): DSİ Matbaası, Ankara pp 46. Turan Kızılkaya(1983): DSİ Matbaası, Ankara, pp 62. F.Homma (1968): International Institute for Land Reclamation and Improvement, Wageningen, The Netherlands. Water and Land Management Institute(1985): Proceedings, Aurangangabad, (Maharashtra), 22nd and 23rd Nov.1985. Water and Land Management Institute(1985): Publication No.11 Aurangangabad, (Maharashtra), India, September.23-October ,1985. Water and Land Management Institute(1989): Publication No.38, Aurangangabad, (Maharashtra), India, March 1989. December 1981: Energy and water conservation strategies in irrigated agriculture, Declining block rates can encourage water conservation, Statistical analysis of hydrological droughts, …. 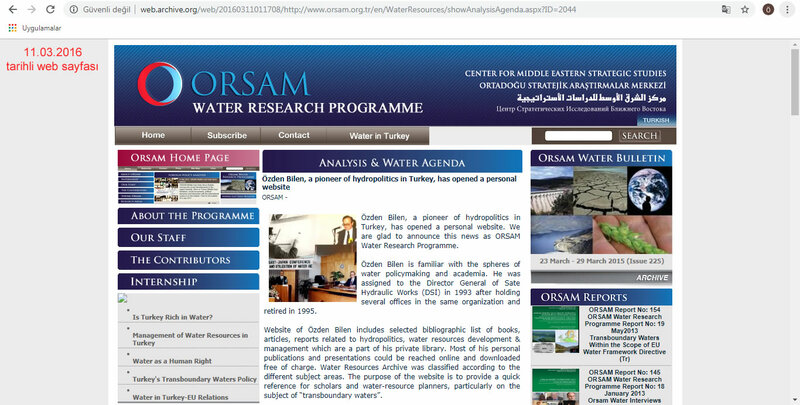 September 1983: Multiobjective analysis of irrigating planning in river basin development, Wind-mills for small scale irrigation, The Policy Delphi and public involment problems,…. December 1983: Choosing the Optimal Water Conservation Policy, Reducing Water Demand and Waste Water Demand and Waste Water Flow ,…. March 1984: Water Resources in China/Progress and prospects,…. June 1984: Implications of drought for water resources projects in Avustralia, Drought and desertification : aglobal reviev,…. December 1984: Water pricing research need, Watershed responses to conservation measures,…. June 1985: Climatic change and its effects on water resources,…..
September 1985: Non-conventiational water resorces -Economics and experiencies in developing countries,Microcomputer programs for designing water systems, Waste water re-use,…. September 1986: Water transfer the Grand North American debate, An application of mathematical programming in planning surface storage, Wtland ecosystem studies from hydrologic perspective,…. March 1987: Australian guidelines on design floods for dams; Trends in third World hydro development, Environmental implications of water resources projects, Flood estimates,…..
June 1987: Hydro and environment/evaluating the tradeoffs, Application of EIA to water resources projects, Flood management, Flood forcasting,…. March 1988: Effects of large scale affrostation on Tawera River Flows, Study support for solar -pump supplies,..
September 1988: Assessing of irrigation on stream flow; Trends in irrigation developments,…. September 1989: UNDP-WORLD Bank- Regional water andsanitation groups/ A new approach to sector development, Greenhouse effect and climate change,…. December 1989: Stochastic-Deterministic nature of an elemental rainfall runoff process, …. March1990: Economic framework for flood and sediment control with detension basins, Rethinking flood-conrol channel design, Manegement of Murray Darling Basin of Australia,…. September 1990: Valuing irrigation water in Punjab provinve, Pakistan / A linear programming, Recharging ground water, …. March 1991: Photovoltaics for Pumping Water,…..
June 1991: WMO/UNESCO Report on Water Resources Assessment, ..
September 1991: Integrated approch to flood disaster management and rural development, Water resources management in smal island countries: cost recovery and demand management,…. December 1992: Estimating urban residental water demand : Effects of price structure, conservation and education, Optimal design of river powerplants, Research/ Aplication of sistem engineering to water resorces systems,. The World Bank (1995): Seminar organized by the The Economic Development Institute of the World Bank,and Comision Nacional del Agua de México, Mexico, 8-15 February, 1995. Ministry of Water Resources (1995): New Delhi, 19-23 June 1995, pp 419. Southeastern Anatolia Project Regional Development Administration (1993): Şanlıurfa, 6-8 December 1993. DSİ İşletme ve Bakım Dairesi Başkanlığı (1986): DSİ Matbaası, Ankara, pp 200.